Inspiration can be such a strange thing - when and how it strikes and what prompts it. At Christmas I was fortunate enough to win a raffle - the prize being a hot stone massage - how lucky was I! It's taken me half a year - but I finally managed to squeek it in just before the gift token expired! I sat in the very elegant waiting room, enjoying the tranquility, aromas and style and then my gaze fell on a beautiful, sleek copper water pitcher sitting on a timber table in front of the Aubergine coloured wall and inspiration started to tickle my brain. Then I noticed the elegant taupe curtains and the aubergine and taupe chairs and the copper colour repeated in the paintings on the wall. At that point I'm afraid I broke the serenity by feverishly rummaging through my bag looking for my note pad and pen to write down: Elegant Eggplant, Tip Top Taupe, Copper. Inspired by the decor at a local beauty spa! So I've added a layer of Chocolate Chip behind the Elegant Eggplant and the base card is Early Espresso. 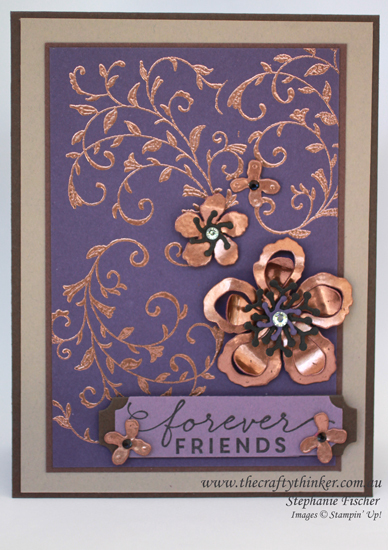 I stamped the flourish from First Sight onto the Elegant Eggplant layer with Versamark and heat embossed it with copper embossing powder. I left the lower right quandrant free to try to give more impact to the flowers. The greeting from First Sight is stamped in Basic Black onto Perfect Plum and cut with a die from the Project Life Cards & Labels framelits - I just resized it and then did the same thing with a piece of Early Espresso to put underneath. I popped this little "banner" up on dimensionals and offset it a little on the card for a bit more interest. To make the copper flowers, I grabbed a piece of retired cardstock (colour unimportant) and gave it a good coat of versamark. I then gave it a good sprinkle of copper embossing powder and used the heat tool. After giving it a minute to cool, I ran it through the Big Shot with the Botanical Builder framelits. I then shaped the flowers with a bone folder and ball tool on a piece of foam. I cut centres from Elegant Eggplant and a little black to contrast with the copper. I added plain Rhinestone jewels to the larger flowers and for the smaller flowers, I coloured the rhinestones with a black sharpie before I put them into the centre of the flowers.